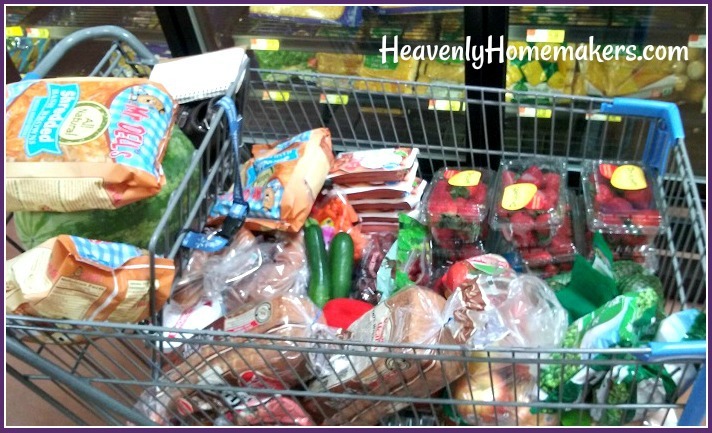 Read Part 1 – The Day I Got Mad at Groceries and Food in General here. …I headed to the grocery store. I had my list ready to go. I also had our full calendar in mind, knowing all too well what the next two weeks held for my family. 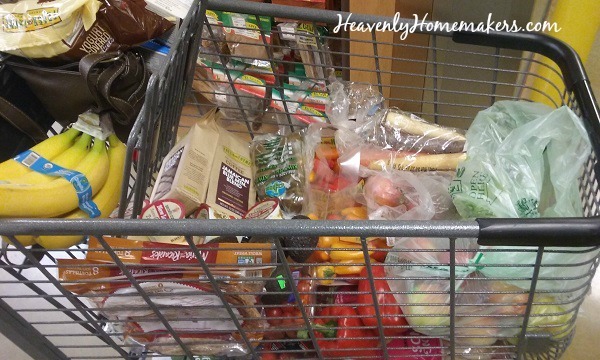 Which was bigger – my grocery list or my to-do list? Oh, now that’s a tough one. 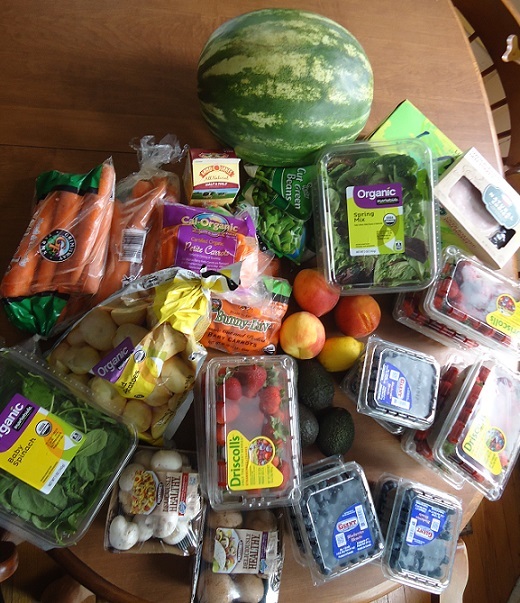 So I prayed for a balanced approach to my shopping. God is not above me asking for help in selecting food for my family. God cares about every detail. He knows my desire to be a good steward and also my need to not over-burden myself in the kitchen. He knows what’s on my calendar. He knows how much my boys eat. He knows we need a new vehicle. He knows. 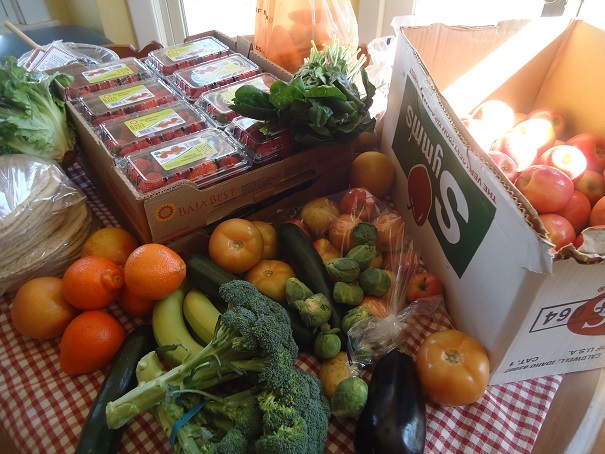 At the store, I filled my cart with a wonderful variety of fresh produce from strawberries to peaches to zucchini to peppers to apples to asparagus to watermelon to avocados. 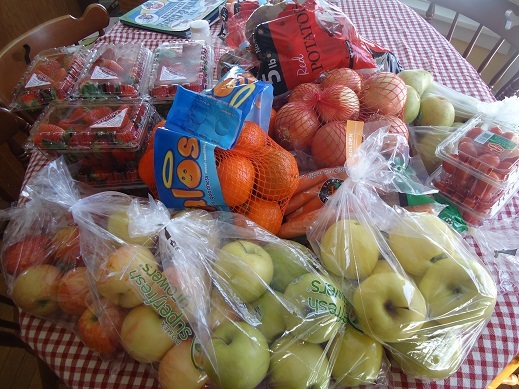 I got all the produce at wonderful prices thanks to price-matching. Then I compromised and bought a few loaves of bread, even though I know how to make it myself. I bought pre-made frozen hashbrowns, even though I know how to make them myself. (By the way, the only ingredient in the Mr. Dells brand frozen hashbrowns is potatoes. The lack of fillers made me add three bags to my cart!) I bought several packages of nitrite-free, uncured beef hotdogs for fast and fun lunches on the grill. I bought bottled BBQ Sauce, even though I know how to make it myself. I got good deals. I was careful about everything that went into my cart. But doggonit, when I want to make Grilled Chicken this week, I’m gonna open up a bottle of pre-made BBQ Sauce, dump it on, and go about my day. make decisions about what works for our family and what doesn’t. realize that just because something had been working for our family, sometimes a change is in order. ask God for clarity, peace, and help in all areas in our lives. Actually, I have no conclusions. I conclude that what I conclude today may be different from what I conclude next week. Right? Often if it’s best if we just think about today. I trust God to make it all clear to each of us when it comes to saving money, eating well, and saving time. I will continue to follow Simple Meals plans because without them, I’m lost and frustrated at dinner time. The recipes and every aspect of these plans are so easy I barely have to work and I rarely have to think. This is how I’ll continue to do dinner. With that, when a recipe calls for BBQ sauce, spaghetti sauce, salsa, or beans – it’s coming out of a jar, bottle, or can because it is still real food, the price is still reasonable, and I don’t have time to make every single ingredient from scratch right now. Lunches and Breakfasts might need to be some of the same choices over and over for a while. This will cut down on my need to think so hard, and make it easier for the boys to help themselves. As long as I always have plenty of fresh or frozen fruits and veggies to fill the table, I can relax about the occasional hotdogs or pizza. What have you found helps you most when trying to find balance in saving money, eating well, and saving time in the kitchen? Did you get these yet? 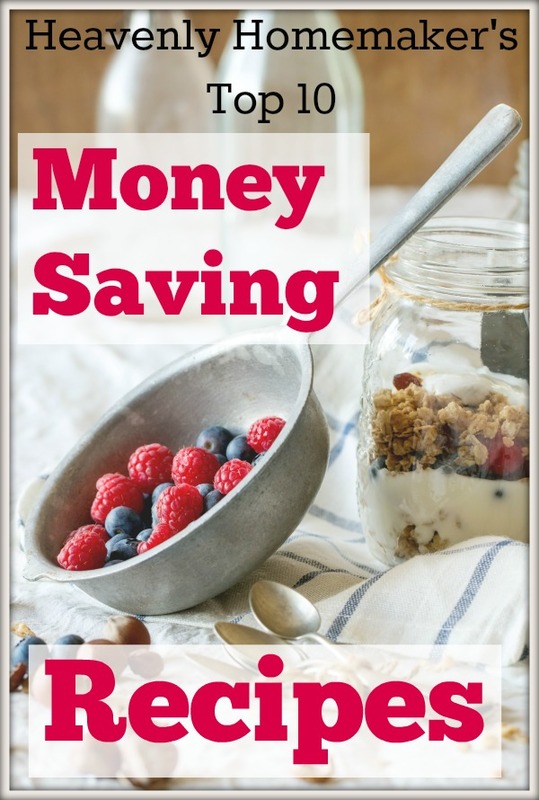 Here are two free ebooklets Top 10 Money Saving Recipes and 30 Real Food Money Saving Tips! A few weeks ago I talked about how our family is having to tighten our budgeting belt right now as we build up our savings again after needing to replace our van right after investing in a new business venture for Matt (radon mitigation). We eat a lot of food. This time of life filled with a houseful of teenagers with all their friends and comings and goings and activities and growing experiences is very much like (except very different from) my years of raising a houseful of babies. Those were lean and busy years too, also a time in which I was trying to avoid going crazy (while the Blue’s Clues theme song played on repeat in my subconscious). All of life cost less then, seeing as we didn’t have a slew of teenage boys included on our car insurance policy and their shoes and appetites were much smaller. These are the years we might need to compromise a little on making all food from scratch and settle for the occasional pre-made tortillas and take-and-bake pizzas. I felt it in the baby-raising-years, had a bit of a reprieve as my kids got old enough to buckle and wipe themselves, but am back to feeling the pinch of time, money, and energy as I am in a season of “hold on for dear life” with my teenage and adult kids. Add to that the fact that one by one my boys insist on graduating high school and moving out of my nest and I feel the need to use every minute with them for a greater purpose. As I watch these years with kids at home vanish before my eyes, I refuse to use any of this precious time with my back turned to them while I spend time on a task like making Mozzarella Cheese. All this was going through my head one day recently as I made a grocery list. “Save as much money as possible!” thought I. “Nourish us well; this is so very important!” came my next thought. “Take time to enjoy the family; save your energy; save yourself; buy the pizza!” – and with that I got angry. Is it even possible to do all of this at the same time? To save money, to eat good food, and to not spend hours in the kitchen while making it all happen? Fine. Good enough. Okay, I guess. And sure, I’ll serve it with a salad and slices of pineapple, but I won’t have saved money and I will have filled us with some empty carbs. This has to be okay, because okay is the best I can do. The best I can do is actually something to be celebrated. The best I can do truly is the best. 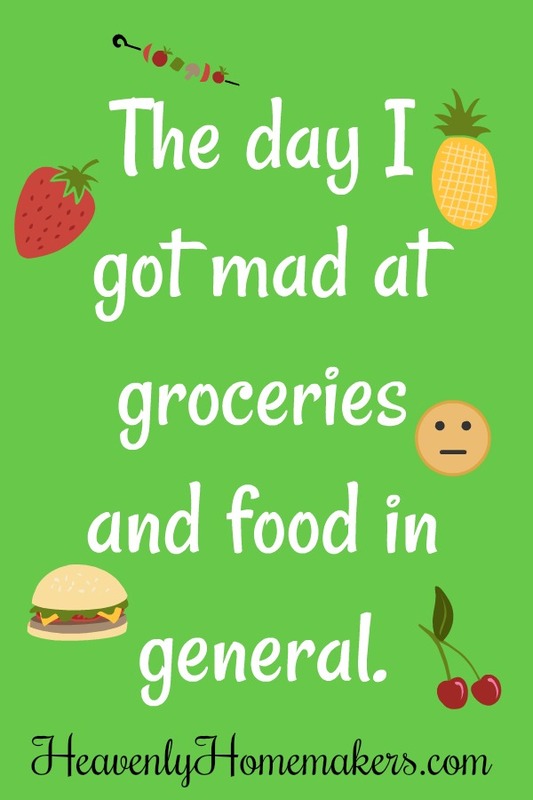 Whether it’s a frugal meal that only cost $1.00/plate or a super nourishing meal filled with fresh greens and veggies, or a corndog on a stick that came out of a box. The best I can do is what offers my family the best of me. And with that, I’m no longer angry with food and will head to the grocery store. 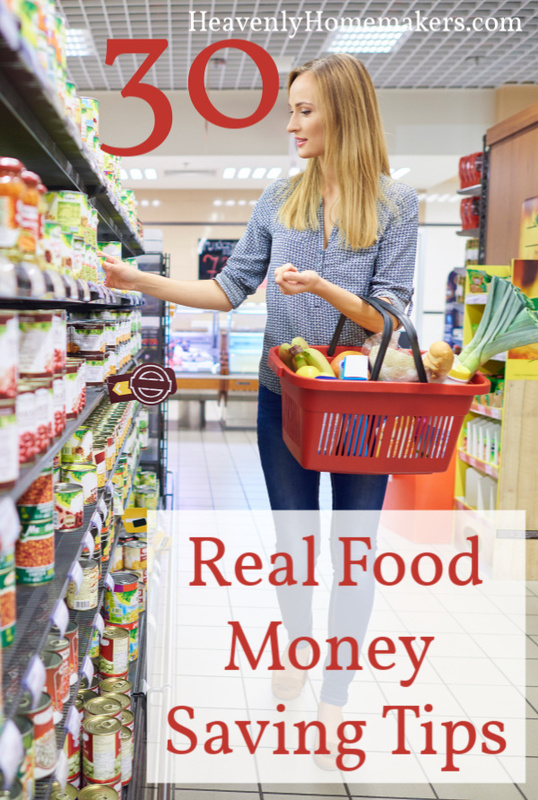 Real Food Grocery Savings Freebies for you! I’m always trying to save on my grocery budget. Aren’t we all? The good news is that having more than one kid in college offers additional grants for students. The other good news is that our kids have been working hard for years and saving money to help pay their own way through college. More good news is that my kids have worked hard to receive and maintain good scholarships to make their college bill lower. Praise God for scholarships and hard working kids that make that total much lower, but still. Matt and I have made plans to help each son with a specific dollar amount each year. To state the obvious, when we have two in college at one time, we will be forking out twice that dollar amount every year. Someone please throw a glass of cold water on my face. One would think my grocery bill would go down as the kids fly the coop, but so far, that hasn’t been the case. 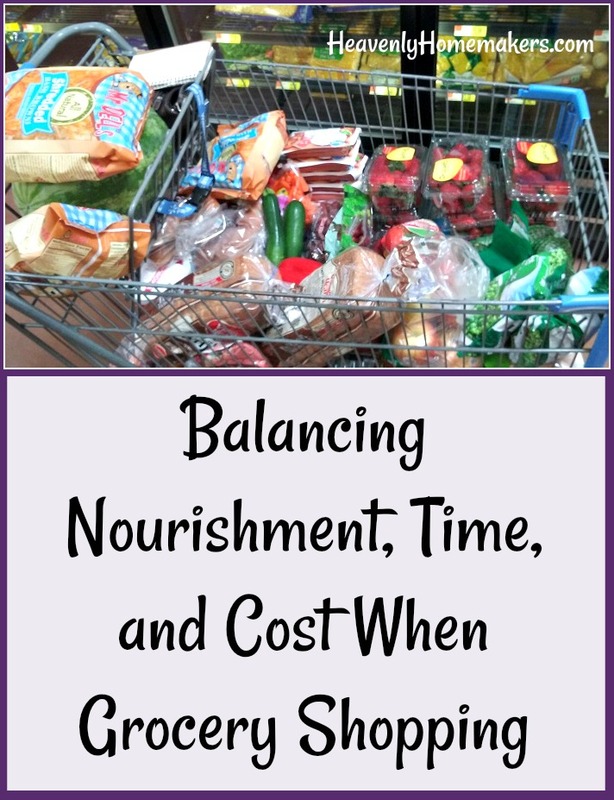 As our personal savings account has dwindled recently because of a business investment for my husband (allow me to introduce to you our town’s newest Radon Mitigation Specialist), and then our family van died suddenly, I have felt challenged to reconsider what I wrote a few weeks ago about my huge grocery budget. 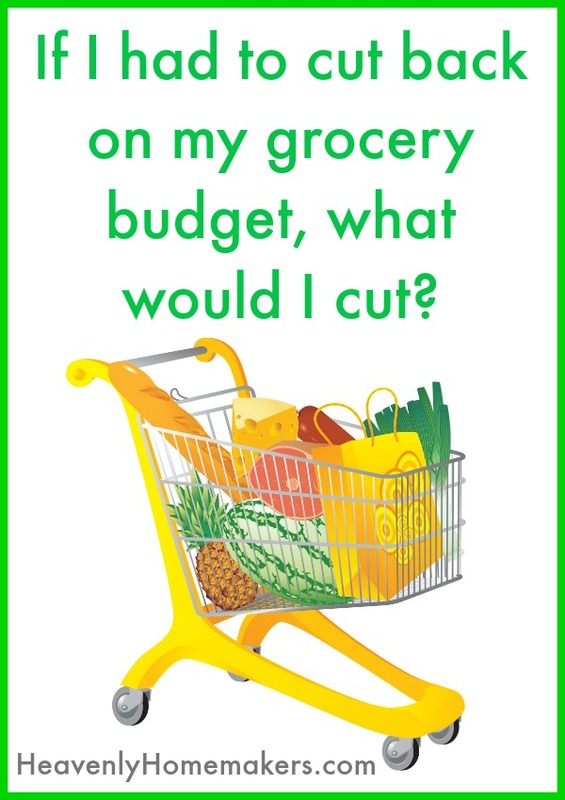 There are no other ways I can cut our grocery bill. My teenagers eat an enormous amount of food. I make a lot of our food from scratch. I keep our meals simple, not elaborate. 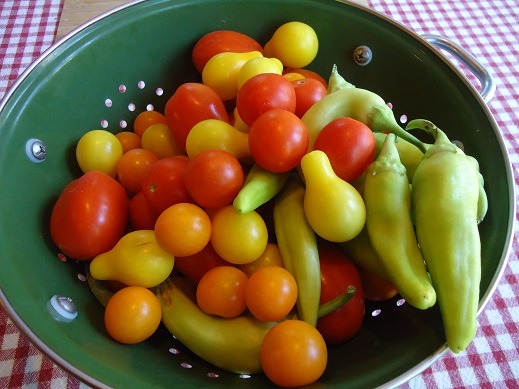 I preserve food from our garden if there happens to be any excess. We only eat out when traveling, and then often we pack our food to take with us. I buy our meat in bulk and our eggs and milk from local farmers, all for reasonable prices. I watch for mark-downs on any of our favorites at the grocery store. I stock up on anything we use often whenever it is on sale. I stock up at Aldi on staples whenever I make a trip to the city. I stopped buying everything organic even though it makes me cringe a little bit. Don’t buy pre-packaged snacks for the boys to eat at games, even if they are “healthier” and even if they are a good deal. Eat some of the “random stuff” hanging out in the back of the pantry and freezer whether it’s exciting or not. I plan to peruse this book again to trigger more ideas (get yours here – it’s free!). Knowing my family situation (four teenage sons, big eaters, focus on eating nourishing foods instead of fillers), do you have any more suggestions to share? I’ll share an update in a few weeks once I see how some of these experiments go! 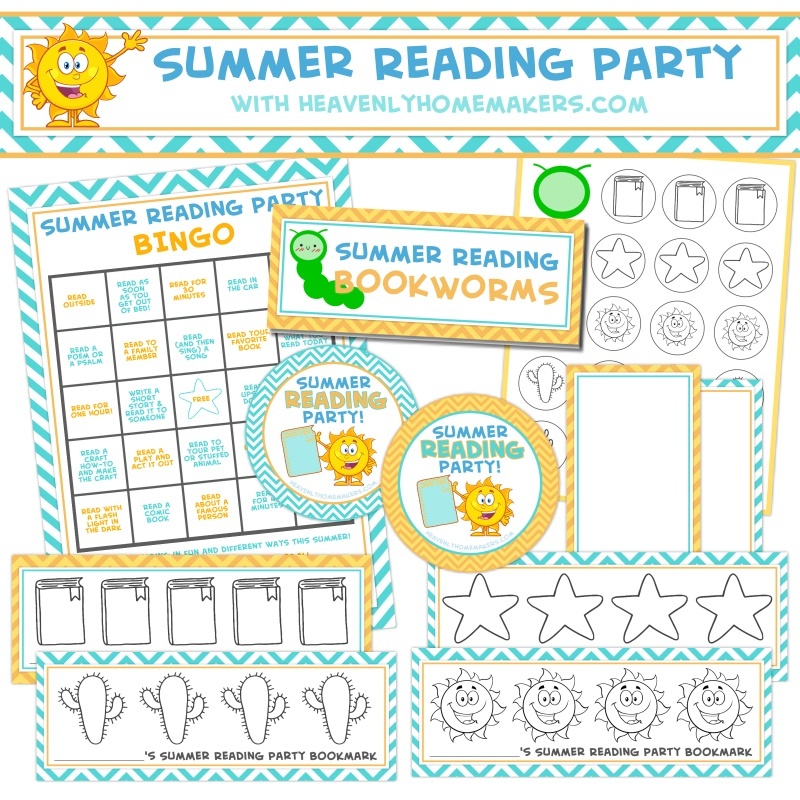 Did you grab all your fun Summer Family Reading Party freebies yet? We’ve even got a printable Summer Bible Reading Guide for you! Today’s idea is quite simple, and great for a busy school morning. 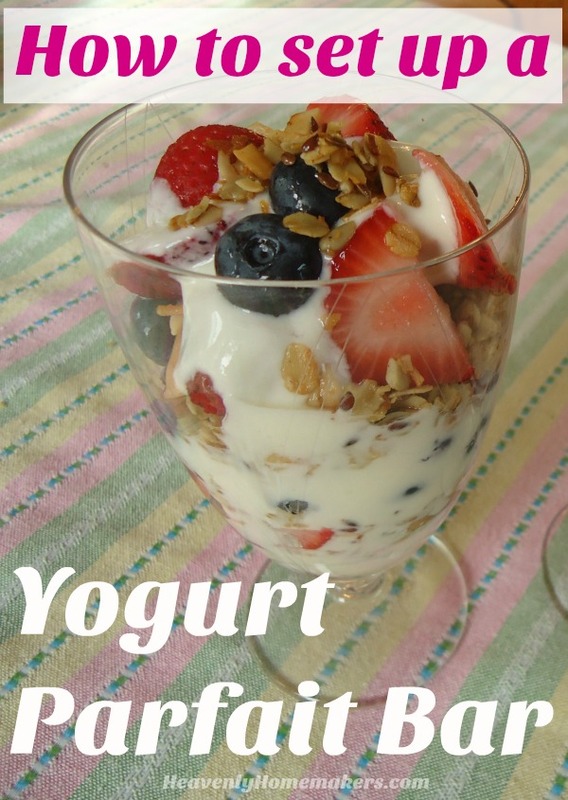 In fact, this would even work as a “breakfast on the go” option by simply building your yogurt parfait in a plastic cup or glass jar and eating it on the way out the door. Want to save even more time? 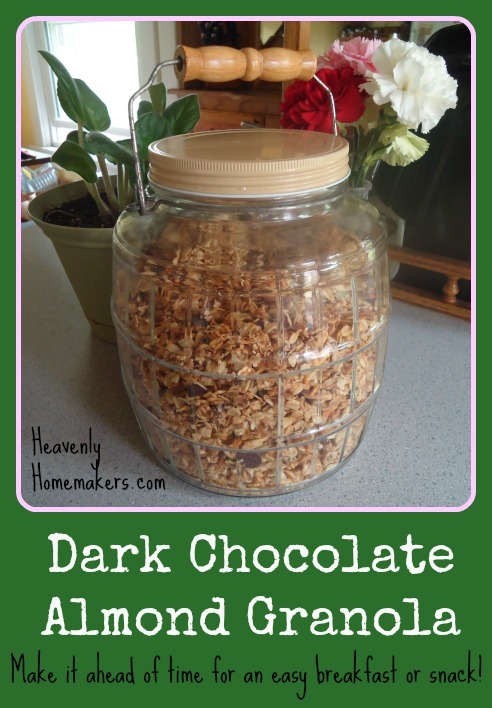 Make this 5-Minute Stop-Top Granola! Typically it is less expensive to purchase larger tubs of yogurt instead of individual cups. If you buy whole milk plain yogurt, you can add any sweetener you like and make it for your sweetness preference. 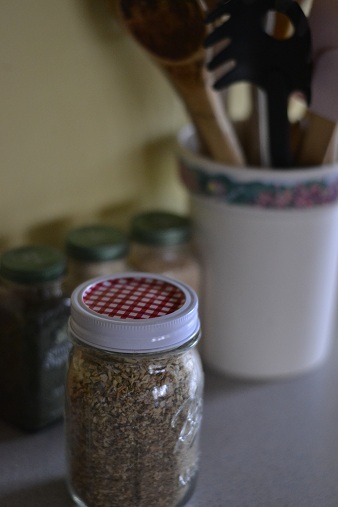 You can make Homemade Yogurt. 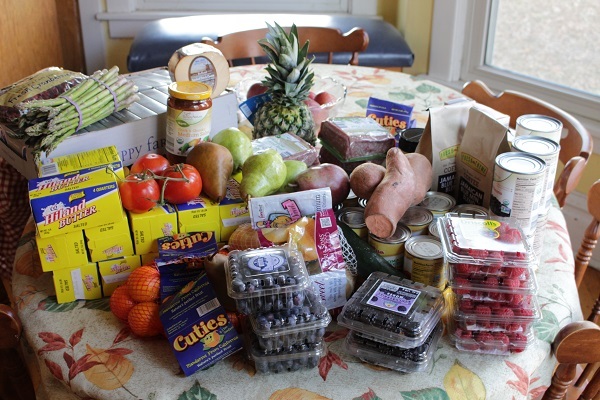 Offer berries and other fruit that is in season and thus less expensive. Did you see all 60 of these great Make-Ahead Breakfast ideas? We will survive busy school mornings, we will! 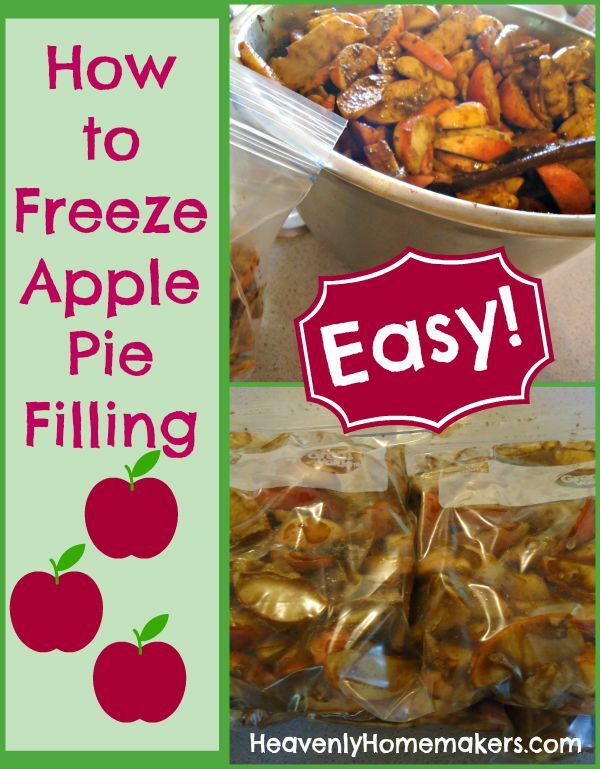 How to Freeze Apple Pie Filling – Easy! 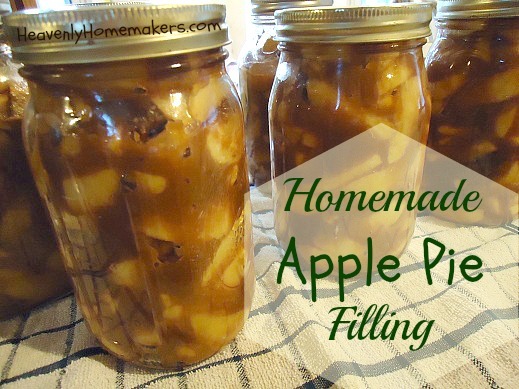 When it comes to making and preserving Apple Pie Filling, you have a few choices. You can can it (can can, can you do the can can, can you…). You can freeze it, which I will describe here today. Or (and this is by far the most novel idea of them all) you can put the filling directly into a pie crust and bake it immediately. It all comes down to how much freezer space you have, how much pantry space you have, if you love canning produce, if you have plenty of jars, or if you really just want to eat an apple pie after dinner on this very day. But really most of it comes down to apples. You can’t do any of this if you don’t have apples. So…do you have apples? I have apples. This year I decided that the easiest way for me to preserve Apple Pie Filling is to freeze it. If you want to can apple pie filling so that you can store it in your pantry, you can learn how to do that here. You should know that I break out in a sweat every single time I type the word p-a-n-t-r-y. I re-read it four hundred and eighty times to make sure I didn’t leave out the “r” because that would bring a whole new unintended meaning to my sentence. 2. Stir in 1/4 cup sucanat or brown sugar plus 1 teaspoon cinnamon per every 5-6 apples. 3. Transfer mixture to quart-sized freezer bags, 3-4 cups of apple pie filling per bag. 4. Label the bag and freeze it for up to a year. When you’re ready to make an apple pie, simply thaw and dump the contents into an unbaked pie crust, then proceed as you normally would to make an apple pie. Here’s my Whole Wheat Pie Crust recipe. Even easier, use the filling to make an Apple Crisp or a Salted Caramel Apple Crisp. It’s wonderful having prepared apple pie filling in your freezer, and yes, even in your pantrrrrrrry. How’s your apple supply? 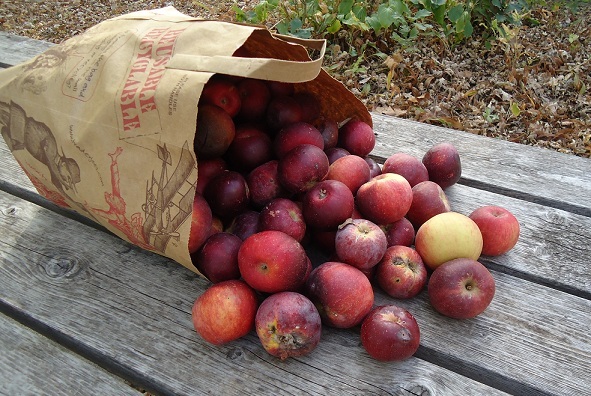 Have you been able to get your hands on plenty of good apples this year? 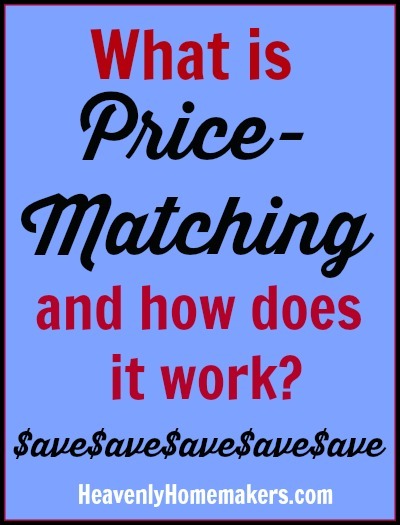 What is Price Matching and How Does it Work? I’ve recently learned the art of “price matching.” Where has this been all my life? (Right under my nose. I just never looked into it before.) This new practice has been saving me $10-$40 per week. That’s $40-$160 per month. That’s big savings for my family of big eaters! Wal-Mart offers an Ad-Matching Guarantee. This means that if another store within 50 miles is offering a specific food at a lower price (shown in their weekly ad), Wal-mart will honor that price. Read all the detailed information about their policy here. It is important that you pay attention to the details of the grocery store ads. Price matching is only valid on items “pound for pound,” “ounce for ounce,” etc. I try to be very diligent about making sure I don’t accidentally pick up the wrong size item. Sound complicated? It really isn’t. It took me exactly one shopping trip to work out all the kinks and learn how easy this practice is. Before going shopping each week, I spend a few minutes looking at all relevant grocery store ads online. We have very few stores in my town, so I am thankful I can price match with the stores in our nearby cities which have 6-7 stores to price match with. 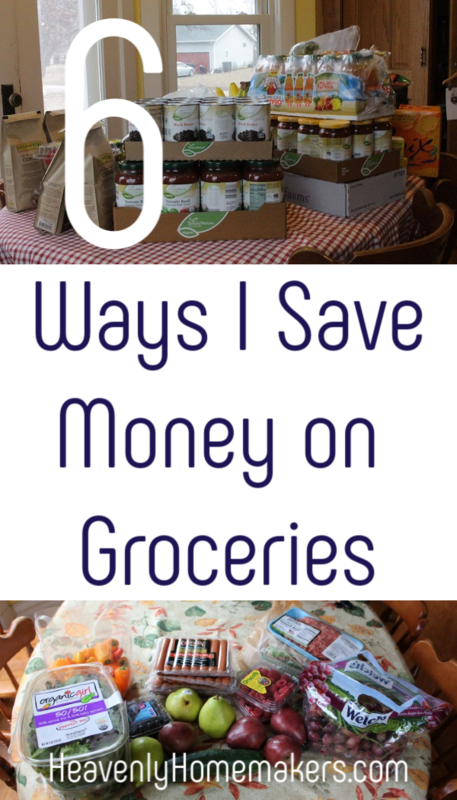 I find the lowest prices from each store (mainly focusing on the produce), and make my list. Wal-mart employees have been trained to quickly adjust the price of the items you are price matching. You simply tell them the price you found that was cheaper, and they ring it up at that price. Easy! 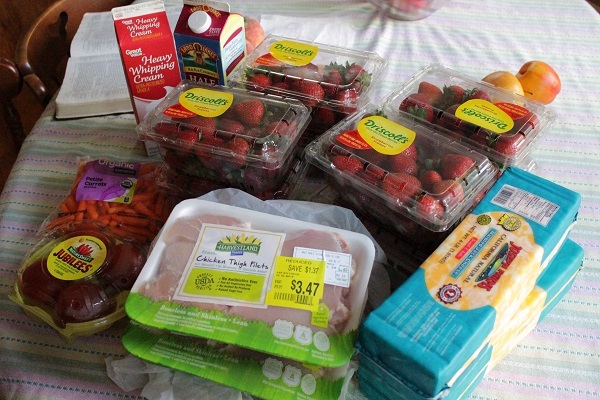 I try to separate my price-match items from my other items to make it easier on the cashier. Cashier: You have such beautiful hair. Me: These are my price-match items. Cashier: Great, we’ll start with the pears. How much? Cashier: Okay, now how about these onions? 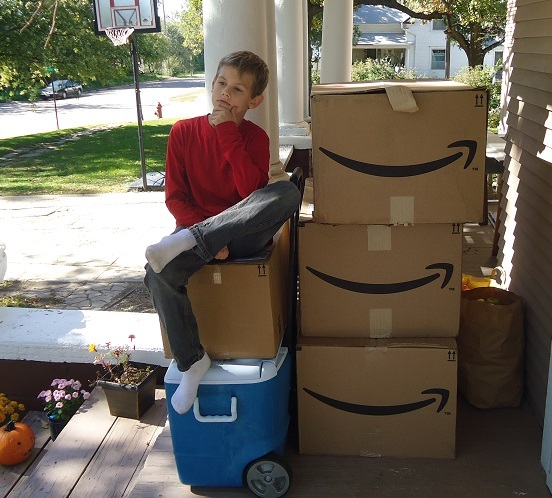 Here’s an example of everything I bought and how much I saved through price-matching last week. Price matching saved me $31.17 this week. It took me about 10 minutes to sit at the computer and find the prices I wanted to match and make a list. Saving over thirty bucks in 10 minutes to feed my family real food? Yes, I think that’s very worth my time! Watch that you don’t fall into the trap of snatching up good deals on processed foods. Those are out there too, so of course, I had to remind us all that those are just not worth the “price” we pay later. 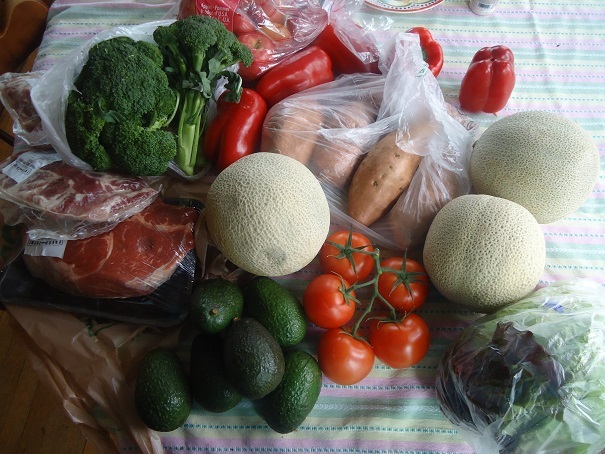 You’ll be surprised though at the great deals you can get on fruits and vegetables, meats and cheeses, often organics too! Share with us! Do you take advantage of Wal-mart’s price matching policy? How does it work for you? Have any other great tips to share about this? As the old saying goes: Where there is no plan, there is no casserole. I think that’s in the Bible somewhere. Or maybe I just made it up twelve seconds ago. How about this one: A frozen chicken will remain frozen if left in a frozen environment. I definitely made that one up. All this proverbial insight to say: Menu plans are really nice. They help you save money. They help you eat healthier. You should make meal plans. For all of you (and I know there are some) who find that meal planning hurts instead of helps you – I say keep doing what you’re doing to put healthy meals on the table. No need to fix what isn’t broken. For everyone else, I’m determined to do all I can to encourage whatever it takes for you to prepare simple, healthy meals that don’t break the bank. Menu planning can be a big help, but it can also be overwhelming if you haven’t found your menu planning comfort zone. I want to help set us up for menu planning success as best I can. I don’t actually like the word success because we seem to think that the opposite of success is fail – and that isn’t true (see paragraph above, in which I use the word fail, but wish I didn’t and there’s nothing I can do about it now). So let’s go with menu planning empowerment, how does that sound? 1. One of my favorite ways to be inspired and gain ideas is to look at recipes. I look at cookbooks and on Pinterest, but mostly, I scroll through my dropdown menu of the hundreds (maybe thousands?) of recipes right here on my website. They are categorized, alphabetized, and even though I’m the one that put them there, I still come across recipes I forgot existed. It’s fun! 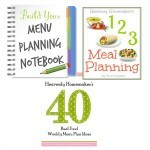 Doing this offers variety to our menu and gets my food planning creativity flowing. 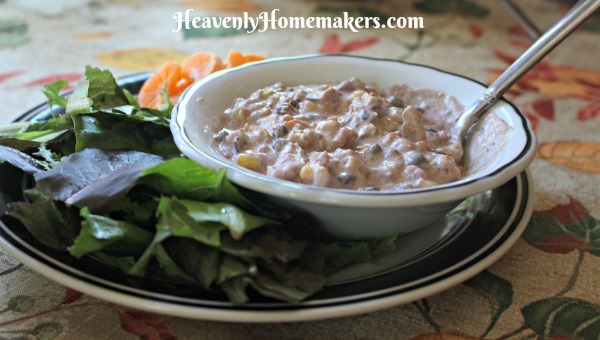 I typically pick seven recipes in each meal category and plug them into my menu for the week. There is flexibility, of course. There is always flexibility. My menu plan doesn’t own me, it simply acts as a guide. 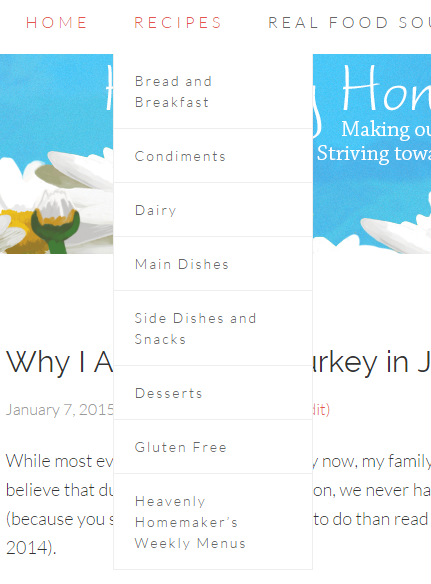 Below is a screen shot of the dropdown menu on my website when I’m holding my cursor over the word RECIPES in my header. Do that, then click on any page you need. You’ll see lovely lists of real food recipes to pick from. Let your family help choose recipes to try if you like! 2. I’ve written and shared hundreds (maybe thousands?) of menu plans here through the years. They are all in my archives, found at this Menu Planning Archives link. These are fun to look through for inspiration because they are complete menu plans, full of ideas for ways to pair side dishes with main dishes. 3. 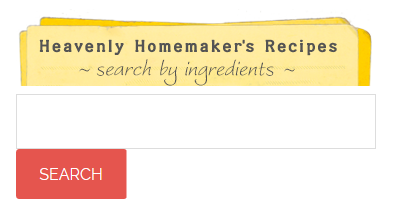 Our Heavenly Homemaker’s Recipes – Search by Ingredients feature is a really fun way to plan meals based on the ingredients you have in your home. If I’m at a lost as to what to plan, I simply type in a few key ingredients I want to use (such as beef, cheese, tomatoes), then scroll through the recipes that pop up for me. You’ll see this special search box at the top right of my side bar. Use it! It’s fun and helpful! 4. 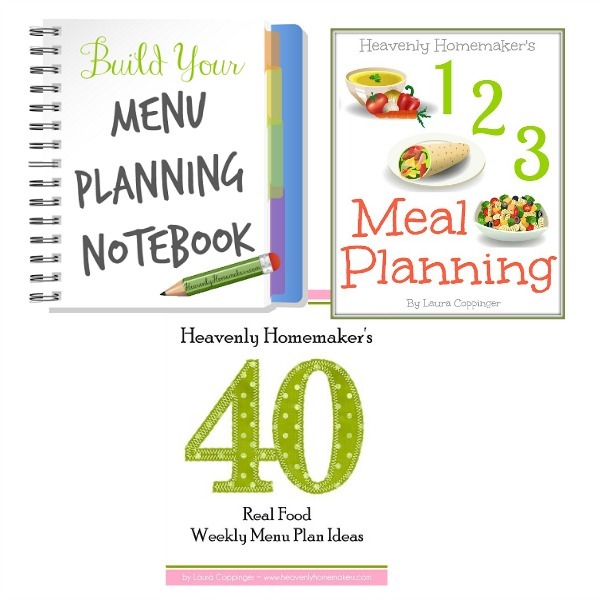 I’ve put together three very thorough menu planning resources through the years: 40 Real Food Menu Plans; 1-2-3 Meal Planning; and Build Your Menu Planning Notebook. The first two share all my best tips and strategies for planning meals, plus they include tons of meal plan ideas. The thinking is already done for you! To bless your menu planning efforts this New Year, we’ve packaged up our three menu planning resources and knocked them down to half price. 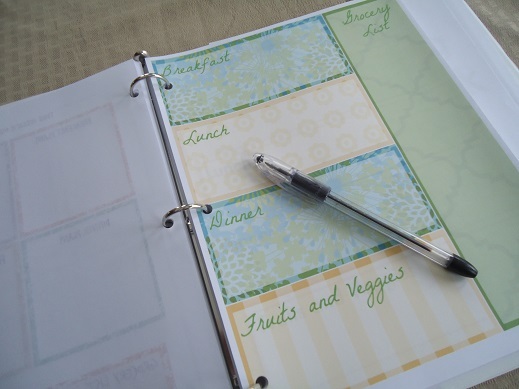 Now’s the time to get into a good menu planning routine! Save yourself some time and money, letting these resources guide you. 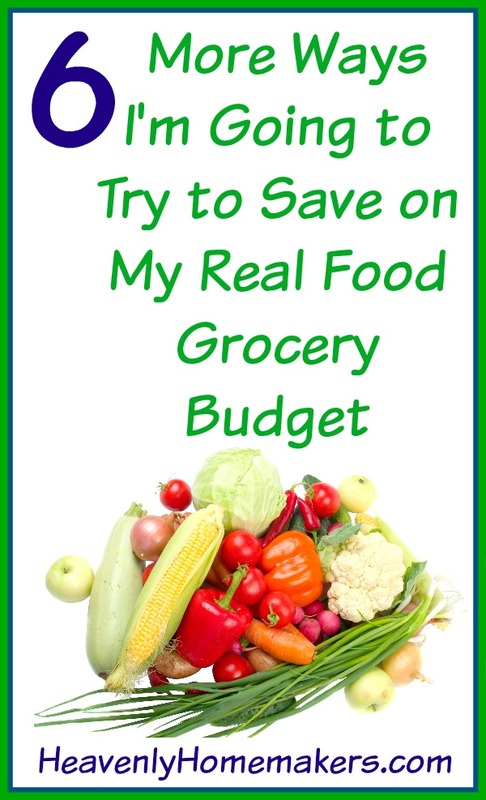 What Are Your Best Real Food Money Saving Tips? Our family has been driving, and driving, and driving some more. Today we’re on the home stretch! After four days in the car driving home from California, we will be home tonight. Can’t wait! 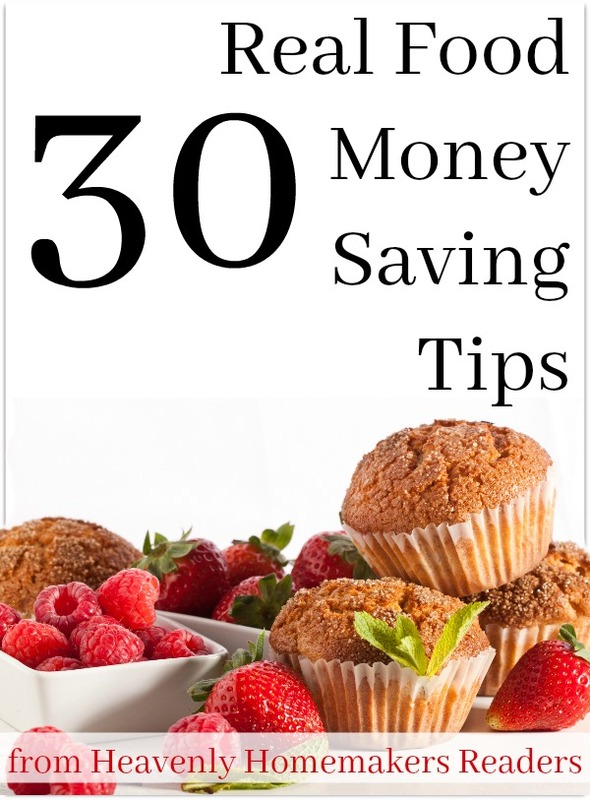 I’m excited to get back into the routine of posting Money Saving Monday tips around here. Today, since I haven’t been able to write a tip, I thought it would be great to hear from all of you instead! 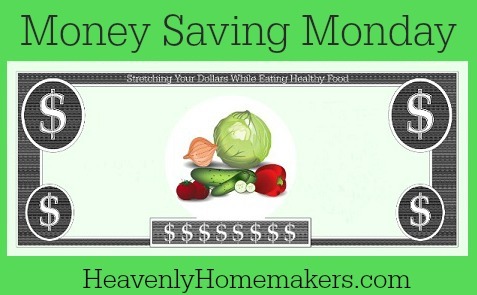 We all have different ways of saving money along our healthy eating journey. Leave a comment to share what works for you! I’d like to put together a free downloadable resource filled with all your great ideas. This will bless so many who are striving to feed their families well. Thanks in advance! Can’t wait to hear all the great tips you have to share!